A retailer has a lot of options to pick and choose he kind of fixtures that woul dbe required in their store. The most commonly used ones include Slatwall; Grid wal;Counter displays which are further ctagorised into Counter-top acrylic displays, counter-top chrome displays tops, counter-top easels and counter-top literature holder, Racks, 2 way rack (T-stand), 4 way rack, Casters. Hang rail racks, Round racks, Gondola and End caps. Fixtures cover a major area of your store and when they are correctly used they help to optimise the available space. Merchant, informs, “Fixtures cover about 70 per cent of the visible store area and play a major part in defining the store environment, price positioning (more shelving indicates its a budget store and more display indicates exclusivity) and product profile (defining what kind of products are sold). Keeping these attributes in mind will surely help a retailer bring out the best for his customers. The fixtures that you use for your store should resonate with the brand image. 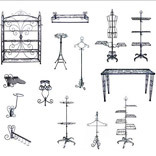 You should have the right mix of fixtures that are in tune with the store category. Personalised fixtures highlighting the kind of products being displayed is another way of creating a signature style for the store. For eg If you have a store which sells natural products, then materials made out of natural elements like hand made or recycled paper, flowers or other environment friendly maerial can be used to give the store the feel that is in sync with the merchandise. Fixtures are usually made of wood, metal or fiberboard. Taking into account the store category, budget and size, one can choose the right fixtures. The retailer also has the freedom to use customised fixtures which can be made as per the requirement of the store. These days, metal fixtures are over shadowing the use of wooden ones because they are hassle free to maintain and portable. The expenditure on fixtures can range from about 25 to 30 per cent of the total cost of doing up the interiors of your store. Further, it can cost a retailer somewhere between Rs 500 to Rs 900 per sq. ft of the retail space. These prices are however variable as they depend on the kind of material used and on the design and space of the store. It is seen that a lot of stores offer the same kind of merchandise but what differentiates one from the other is the experience they offer. The display is what catches the eye of the customers and attracts them to the merchandise. So to convert the window-shoppers into potential customers toil on your store’s fixtures and fix them up right!